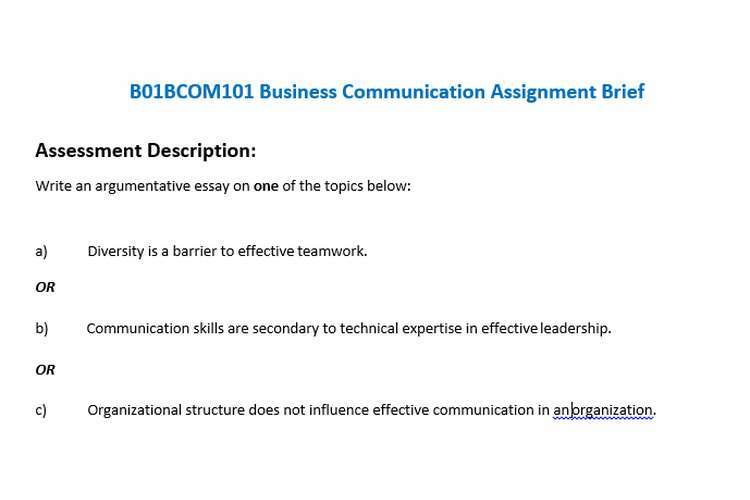 This B01BCOM101 Business Communication Assignment Brief weight is 20% of the total course and requires an essay as well. 1. Diversity is a barrier to effective teamwork. 2. Communication skills are secondary to technical expertise in effective leadership. 3. Organisational structure does not influence effective communication in an organisation. This assignment should be submitted online in Moodle. You are also required to upload a softcopy of your assignment in Turnitin. For assistance please speak to our Academic Learning Skills Coordinators, Andrew Kelly in Sydney (andrew.kelly@kent.edu.au) or Leah Kerr in Melbourne (leah.kerr@kent.edu.au). They can help you with understanding the task, draft checking, structure, referencing and other assignment-related matters. The work must be fully referenced with in-text citations and a reference list at the end. We strongly recommend you to refer to the Academic Learning Skills materials available in the Moodle. For details please click the link http://online.kent.edu.au/cms/course/view.php?id=437 and download the file “Harvard Referencing Workbook”. Appropriate academic writing and referencing are inevitable academic skills that you must develop and demonstrate.